The U.N.-brokered cease-fire between Hezbollah and Israel will begin at 8 a.m. Monday, U.N. Secretary-General Kofi Annan said Saturday in a taped statement. Israeli Prime Minister Ehud Olmert and Lebanese Prime Minister Fouad Siniora agreed on the time, Annan said. But on the deadliest day yet for Israeli soldiers, he urged both sides to stop fighting immediately. "Preferably, the fighting should stop now to respect the spirit and intent of the council decision, the object of which was to save civilian lives, to spare the pain and suffering that the civilians on both sides are living through," Annan said. Hours earlier, Hezbollah leader Hassan Nasrallah said that his militia would honor the call for a cease-fire once a deal on the timing was reached. The Lebanese government, which includes two members of Hezbollah, unanimously approved Security Council Resolution 1701 on Saturday, Siniora said. The announcement followed a meeting of the Lebanese Cabinet, and Siniora said the Cabinet would meet again Sunday to discuss implementation. While Siniora said only the Lebanese Army and U.N. forces would be allowed to bear arms, the two Hezbollah members told the Cabinet that the Islamic militia has no intention of disarming south of the Litani River, about 15 miles (25 kilometers) north of the Israel-Lebanon border, a senior Cabinet member said. Senior Siniora adviser Mohamad Chatah, however, downplayed that report. "There is a national consensus -- and Hezbollah has said that it's part of it -- that there will be no arms in south Lebanon other than the arms of the state of Lebanon and the U.N.," he said. Israeli U.N. Ambassador Dan Gillerman said it would not be enough for Hezbollah to simply lay down its weapons. The Security Council expects southern Lebanon to be free "of any Hezbollah presence," he said. In his televised address, Nasrallah expressed reservations about the resolution, saying, "When the Israeli aggression stops, then the reaction by the resistance will stop." He said the Security Council resolution passed Friday is biased toward Israel, neglecting to blame it for what he described as "massacres" and "war crimes" during the monthlong conflict. Siniora, too, had sharp words for Israel, telling reporters that the Jewish state's decision not to approve the cease-fire immediately gives the Israeli military "a blank check" to continue pounding Lebanon and "targeting civilians." "This is the type of humanity we are getting from the Israelis. This is terror by itself," he said. "Through force, they cannot achieve anything. They have to get back to their senses." Israel has yet to react formally to the U.N. resolution, which calls for a cease-fire and then a massive increase in U.N. troops in southern Lebanon. The Israeli Security Cabinet is expected to take up the proposal Sunday. Israeli Ambassador to the United States Daniel Ayalon said the Cabinet was likely to approve it. The resolution calls for the release of two Israeli soldiers whose capture by guerrillas precipitated the war that has killed nearly 1,000 people. Fighting began July 12. Israel expanded its ground offensive Saturday in its deepest thrust yet into southern Lebanon. The Israel Defense Force said it was airlifting soldiers into Lebanon but declined to reveal the size of the deployment. Nasrallah said Hezbollah will help refugees return home and will support the Lebanese Army and the U.N. Interim Force in Lebanon. 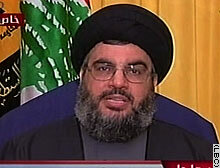 But he said "we are still in a war," and Hezbollah "will continue to defend" itself. "As long as our land is occupied, we will continue the resistance," he said. Media reports say Israel plans to stop fighting in Lebanon at 7 a.m. Monday (midnight ET). But Reuters news agency quoted a senior Israeli official as saying that troops will continue battling Hezbollah in areas where the IDF is operating. U.S. President Bush welcomed the resolution in his Saturday radio address, saying the United States and its allies have worked hard to "create the conditions for an enduring cease-fire." In an eight-minute call to Siniora on Saturday, Bush "stressed the need to dismantle Hezbollah's state within a state in order to build Lebanese democracy," said National Security Council spokesman Frederick Jones.